The third and final edition is bound	as a smyth-sewn paperbacks for a lifetime of hard use. A limited number of copies bound in hardcover are also available. The Gnostic Mass is a hymn to the wedding of scientific truth and religious aspiration. It offers a truly modern spirituality. The celebrant is encouraged to leave superstition and dogma behind and join in an ecstatic tribute to the glorious nature of reality. Aleister Crowley wrote the Gnostic Mass in 1913. He described it as the central ritual—public and private—of Ordo Templi Orientis (O.T.O.). Today it is being performed on a regular basis throughout the world. The authors of this performance guide to the Mass are both longtime O.T.O. members and consecrated bishops of the Ecclesia Gnostica Catholica (E.G.C.). They share between them over half a century of diligent practice and training with this rite. Their devotion has been rewarded with long-sought-after insights into its complex choreography. The detailed instructions presented here not only provide missing keys to the geometrical puzzle of the Mass, but offer a wider window into the workings of magical ritual. This book will thus be of value to spiritual aspirants, as well as to scholars and students of ancient myth, modern religious movements, and contemporary Gnosticism. The authors believe the Gnostic Mass to be a doorway into the highest realms of spiritual development and make a compelling case for that assertion. 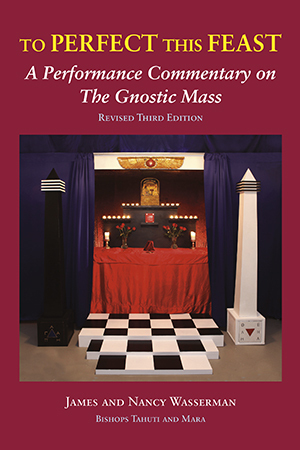 In addition to a detailed commentary, they offer a corrected, uninterrupted Mass Missal suitable for use by individuals and groups interested in working with the ritual, along with valuable insights into magical ceremonies in general, and the Gnostic Mass in particular. "The primary insight we received that prompted the first edition of this book in 2009 e.v. began in December 2005. It is described in the Commentary to Section VI, starting on page 93. It perfectly resolved the mathematical imbalance that had troubled me for over two and a half decades. We were humbled and felt compelled to share it with the wider Thelemic community. We then worked diligently to solve some of the other performance puzzles of which we were aware in Crowley’s stage directions. That quest led us through two previous editions of this book. "We feel we have here solved problems that remained in our understanding of the choreography of the children and Deacon in Sections III, IV, and elsewhere. We noted the occurrence of two additional “X-switches” during a training session conducted in 2012 e.v. They are mentioned on pages 94 and 102. We have refined and explained our version of the Communion in Section VIII better than ever before. We “road-tested” this text twice with a group of five officers who had never done the Mass (three were not even O.T.O. members). That led to several important improvements in the instructions, and to the creation of the Temple diagram on page 52. We hope Mass teams will find the checklist useful on pages 125–127. There are another myriad of minor changes and refinements throughout." James Wasserman first performed the role of Priest in 1979. In 1992 he and Nancy Wasserman celebrated the most widely attended Mass in the history of the ritual, with a congregation of some 500 people. In 2009, they began to share their insights in book form and released an improved second edition in 2010. This third and final elucidation solves certain remaining problems. James Wasserman is also the author of In the Center of the Fire: A Memoir of the Occult 1966-1989, a modern history of the O.T.O., and the editor of Aleister Crowley and the Practice of the Magical Diary. Nancy Wasserman is the author of The Weiser Concise Guide to Yoga for Magick. I did in fact get one of the limited hand numbered editions. Being a collector that certainly put a smile on my face. And I must congratulate you on not only the overall layout and contents which include your well-worded but balanced/succinct propositions concerning "corrections", observations, et cetera ......... but how handsomely produced and aesthetically pleasing the book is. Yes — simple, beautiful, strong — built with love and surely with the idea of durability in mind. I can only assume that Therion would be exceptionally proud, appreciative and approve of this fine, fine book. Peter Paul Seva— November 13, 2013 e.v. I read "To Perfect This Feast" in full last night. This is a text that I'm going to be spending some serious study time with; the commentary, particularly the choreography and clarification of states and aspects to be sought and attained at various points is of great value - I'm an abstract and conceptual thinker by nature, and one of the challenges I face as a magician is understanding and triggering physical states without concrete descriptions to pin them to- TPTF has those concrete markers. I finished reading To Perfect This Feast and found it to be delightful. Your insights and recommendations were intriguing. The section on self-preparations is excellent advice. They reminded me of the "neglect not" from the chapter "De Cultu" in Liber Aleph. Your desciption of an elevation to a state of godhead made me reflect on the phrase "Deus et Homo." From my impressions, the O.T.O. seems to be about this realization and one could contemplate if this God takes on the form as the Lord of the Aeon, your HGA, or both. The secret center of every star being Hadit. Other awakened thoughts came when I recognized the part about speaking words as truth from Liber Israfel, the vertical column from chapter XV in Liber ABA, and I couldn't help but see the Gnostic Mass in terms of devotion to one's God as is done with Liber Astarte. Do what wilt shall be the whole of the Law. The Great Beast 666 instructed us to treat each moment in our lives as a sacrament, a veritable feast for the union of Man and God in God-Man and his going forth in his glory, as he takes his pleasure among the living. One might arguably claim that the Gnostic Mass holds the key to this "life intense with knowledge and extreme bliss which is untouched by" the seed of sorrow." "To Perfect This Feast" then becomes a treasure of insight into this central public and private ritual of the O.T.O. What is so great about this book is that it shows that the Gnostic Catholic Church is a living and breathing tradition with lots of variety, not only among the celebrating clergy, but also among the supervising Bishops. Just as each life is our own to live and consequently there will be variations in how to express this "Perfect Feast," there is also a great deal of individual Genius involved in expressing this central mystery of the Law of Thelema. This is how it should be and it is heartening that more and more Bishops share their insight into our holy Magick, particularly when they disagree with each other. At the same time as this book itself argues, the forces of maintenance must balance those of transgression, revolution must be balanced by tradition and it is in their union that humans thrives the most and is able to evolve. This is confirmed by all findings in biology and psychology and consquently we find that while we are encouraged to express our individual Genius in our celebration of the Eucharist, in order to achieve evolution and true expression this Genius needs structure or discipline. Consequently while each celebrant is bound to the words of the Canon of the Mass, each one of us will bring something unique to it in our partaking of the Eucharist, be it as part of the congregation or any of the five officers. My colleagues the Very Illustrious Tau Tahuti and Tau Mara provides an insightfull and exciting introduction to their findings on the mysteries of the Gnostic Mass. Forged as these findings are in the athanor of more than three decades worth of officiating in the Mass at all levels and as supervising clergy, it bristles with that contagious energy that just makes you want to go our and celebrate the Gnostic Mass immediately. This book is centered as all our writings should be as per the Tunis Comment, on the central teachings of the Great Beast 666 and is layered with many good tips on how to "Perfect this Feast," some of which I will be introducing to the clergy I supervise, in the coming months and which no doubt will continue to spread throughout the Order as more and more reads this book. It is my hope that it will inspire more Bishops to express their own insights, forged by their own experience, in the years that come.